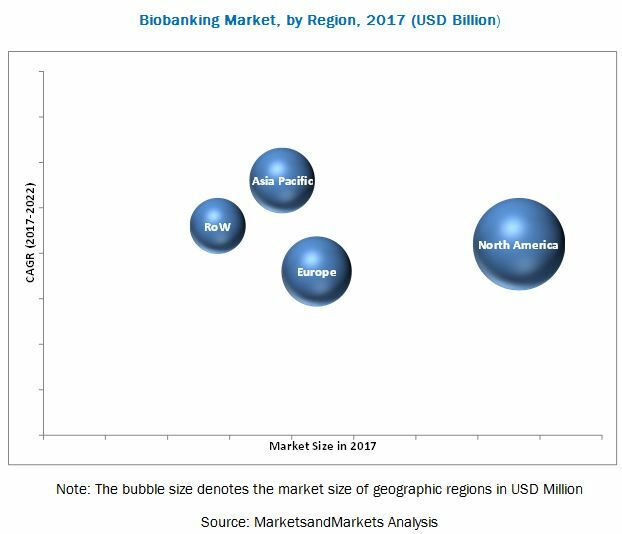 [164 Pages Report] According to new research report, Biobanking Market is expected to reach $2.69 billion by 2022 from $1.72 billion in 2016 at a CAGR of 7.8%. The base year for this study is 2016. The equipment segment is estimated to account for the largest share of the market in 2017. This is primarily attributed to the increasing number of biobanks and rising number of biosamples around the world, due to which the demand for equipment remains high. Biobanking Market plays an integral role in advancing biomedical and translational research, through the collection and preservation of biological samples, such as blood, tissues, and nucleic acids, which are then made available for use in research to discover disease-relevant biomarkers; this is further used for diagnosis, prognosis, and predicting drug responses. Growth in the number of research activities in this segment forms a major driver for the market. The availability of government funding for regenerative medicine, stem cell therapeutics, and cell & gene therapy is supporting research activities in this segment. Apart from this, the increasing trend of cord blood banking will also aid growth of this market segment. Future prospects including advancements in orthopedic procedures with the use of stem cells are expected to further support market growth for regenerative medicine. In 2017, Brooks Automation, Inc. (U.S.) launched BioStore IIIv, BioStudies Biobank Data Management, FluidX, IntelliXcap Decapper systems to strengthen its product portfolio in biobanking segment. In 2016, Thermo Fisher Scientific Inc. (U.S.) entered into a partnership with Hamilton Storage (U.S.) to strengthened Thermo Fisher’s presence in the market. In 2015, Panasonic Healthcare Holdings (Japan) launched MDF-DU900V VIP -86°C Upright Freezer. A number of factors such as increasing number of genomics research activities for studying diseases, advances in biobanking and growing trend of conserving cord blood stem cells of newborns and government & private funding to support regenerative medicine research in biobanking are expected to drive the growth of this market. The global market is segmented by product and service, sample type, storage type, application and regions. By product and service, the market is segmented into equipment, consumables, services and software. The equipment segment is expected to lead the global market in 2017. Factors such as the growth in the number of biobanks and number of biosamples to be stored are increasing the demand for biobanking devices market. By sample type, the market is classified into blood products, human tissues, cell lines, nucleic acids, human waste products, and biological fluids. Since blood and blood products are the most collected specimens and are used as a source of DNA and RNA, this segment type holds the largest share of the biobanking devices market. On the basis of applications, the market is segmented into regenerative medicine, life science research, and clinical research. Regenerative Medicine is expected to account for the largest share of the market in 2017 on the basis of applications. 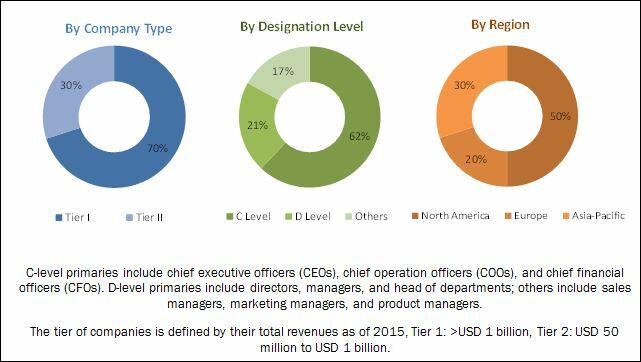 Growing research in regenerative medicine and the increasing demand for well characterized and quality biosamples for research are prime reasons for the growth of this market segment. By storage type, the Biobanking Market is segmented into manual storage and automated storage. In 2017, the manual storage segment is estimated to account for the largest share and the automated storage segment is projected to grow at the highest CAGR during the forecast period. The Global Biobanking Market is dominated by North America, followed by Europe. North America will continue to dominate the global market in the forecast period. However, Asia-Pacific is expected to witness the highest CAGR, with the growth in this market centered at Japan, China, and India. Improving life sciences research infrastructure in emerging economies and growing government investment in biomedical, pharmaceutical, and biotechnology industries are some of the factors propelling market growth in the Asia-Pacific region. The high cost of automation and issues related to biospecimen sample procurement are expected to restrain the market growth to a certain extent. Regenerative medicine is the process of creating living, functional tissues to repair or replace tissue or organ function lost due to age, disease, damage, or congenital defects. The archiving of biological specimens from donors for use in research has become an important resource for regenerative medicine research. High-quality and well-annotated tissue sample collections stored in dedicated biorepositories have become an essential tool in regenerative medicine for developing diagnostic, prognostic, and therapeutic applications to advance human health. In-house laboratories, repositories, and biobanks require primary cell cultures and cell lines for biomedical research, personalized medicine, cell-based research, and related segments. Due to the large turnover of highly sensitive samples in these research activities, it is critical to have a repository for the proper handling of samples. A biosample repository ensures appropriate long-term storage conditions for such samples. The samples are sorted, tracked, and made available to scientists to support life science research activities. A dedicated biobank helps curtail the recurring cost of continuous sample procurement from donor sites, thereby supporting targeted research in life sciences. What are the upcoming industry applications for Biobanking Market? High cost of automation is a major factor restraining the growth of the market. Biospecimen storage instruments are equipped with advanced features and functionalities and are thus priced at a premium. Moreover, since the cost of biobanking operations are not limited to automation, organizations have to consider various factors on which their overall financial stability is dependent before moving towards automation. This, in turn, is creating challenges for the long-term sustainability of biobanks. Major industry players launched innovative products to maintain and improve their position in the biobanking devices market. Hamilton Company (U.S.), Thermo Fisher Scientific Inc. (U.S.), Brooks Automation (U.S.), and Panasonic Healthcare Holdings Co. Ltd (Japan) have been identified as the top players in this market. These companies have a broad product portfolio with comprehensive features and have also launched innovative products. These leaders also have products for all end users in this market, a strong geographical presence, and they focus on continuous product innovations. 12.2 Panasonic Healthcare Holdings Co., Ltd.